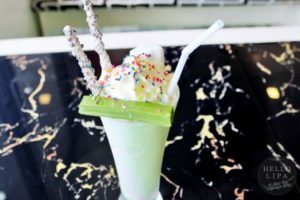 Anchor Point Diner is not your usual diner. 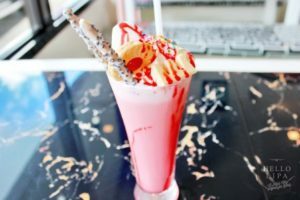 While most diners focus mainly on providing good food, as they should, Anchor Point Diner aims to do more than that. It shows in their tagline – A Voyage of Good Food and Company. It shows that they’re not just about providing good food. They’re also about bringing people together. The diner is owned by Chef Rogelio Templo Jr., Linmuel Magdaluyo (in charge of marketing), Zoilo Mar (in charge of technical and logistics) and Jennifer Anne Templo (in charge of accounting). Chef Rogelio, Linmuel and Zoilo trace their friendship back to their elementary days, while Jennifer came into the picture during their high school years. Jennifer eventually became the wife of Chef Rogelio. 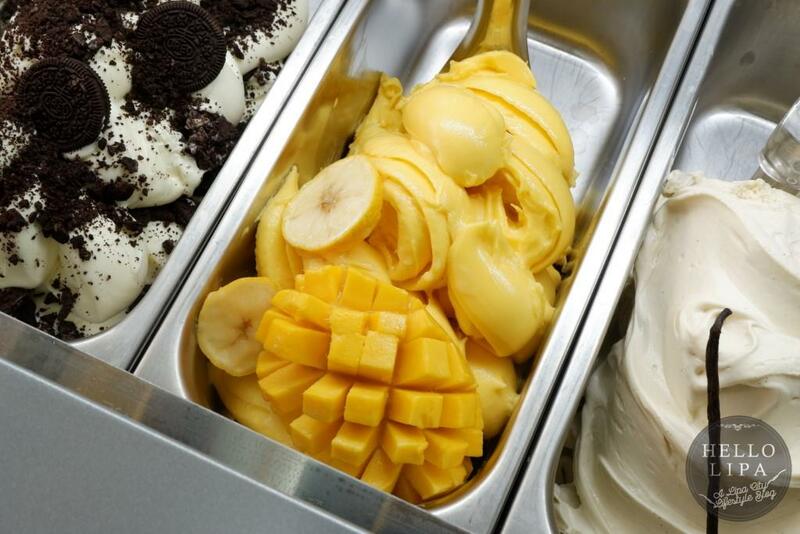 Just like most childhood friends, they dreamed of one day owning a business together. 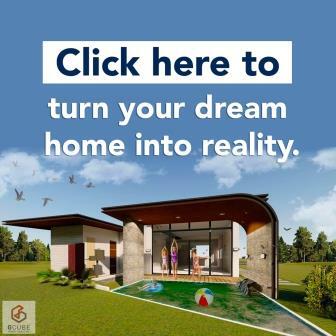 Unlike most childhood friends who had this dream, they actually did it. They went into photography as their first business together. Unfortunately, that business didn’t do as well as they hoped so they decided to close it. Now, it’s obvious that it’s better off that way as that paved the way for them to establish Anchor Point Diner. 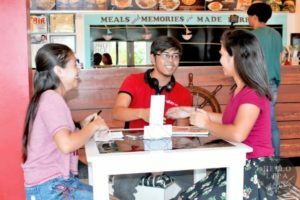 Recognizing the rise of the food industry here in Batangas and with Chef Rogelio’s experience as a seaman and chef in a ship, it was just logical for them to establish a food business. Hence, Anchor Point Diner was born on February 5, 2016 in Mataasnakahoy Batangas. Now, they have 4 branches (Mataasnakahoy, Dagatan, Tanauan and Sto. Tomas) which is an impressive accomplishment within 2 years. 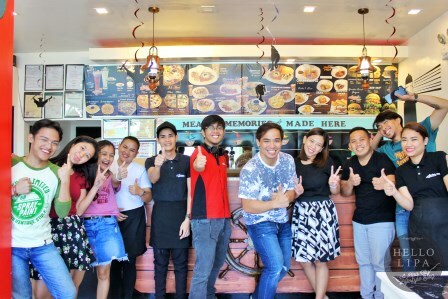 We got the chance to try their Dagatan branch. One of our interns, AJ Rosas. 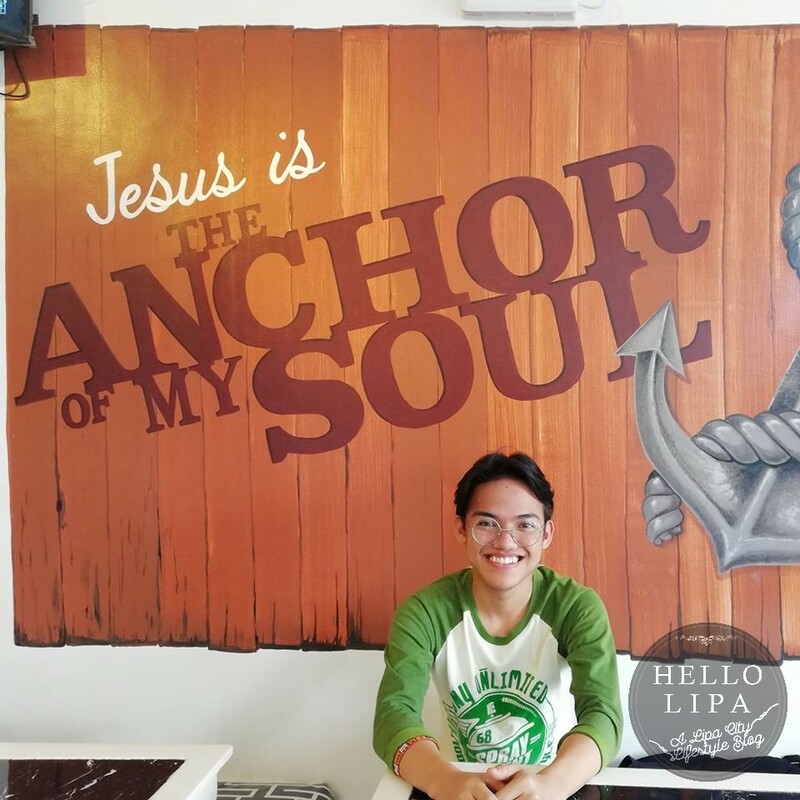 With Christian quotes written on the walls and Christian music playing in the background, one can’t help but feel relaxed and inspired once they enter Anchor Point Diner Dagatan. The owners are advocates of Christianity and it shows in their branches. In fact, it’s a popular venue for people who want to do a bible study and enjoy good food in the process. Their Dagatan branch attracts a lot of natural light which leads to a relaxing stay. The whole ambiance really sets you up for the meal ahead. 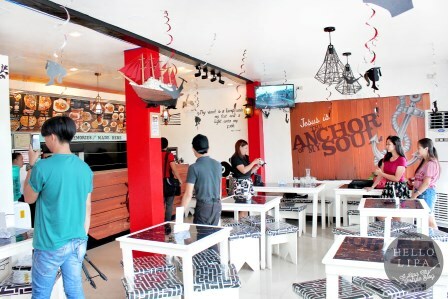 Anchor Point Diner is at that sweet spot in between fast food and fancy restaurant. 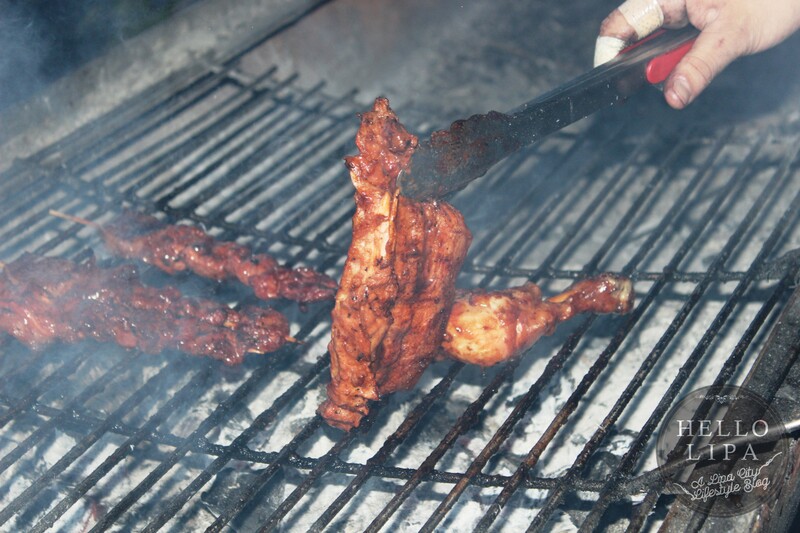 This means that you can enjoy great food at affordable prices. We tried the Chicken Fritoz. I love how crispy the chicken is. Its crunch is just enough. 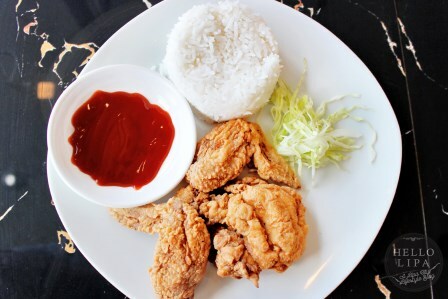 Some fried chicken doesn’t have enough crunch while some have too much to the point that it’s a bit hard to bite into. This one’s cooked just perfectly which of course means that the meat inside is very juicy. It’s also perfectly seasoned with salt and pepper and my palate tasted a few more spices used. I can also recommend the Teriyaki Chicken. 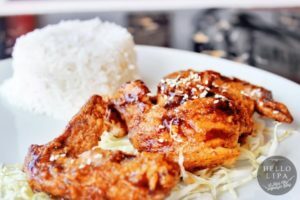 It’s the same fried chicken but this time, it’s glazed with Teriyaki sauce. 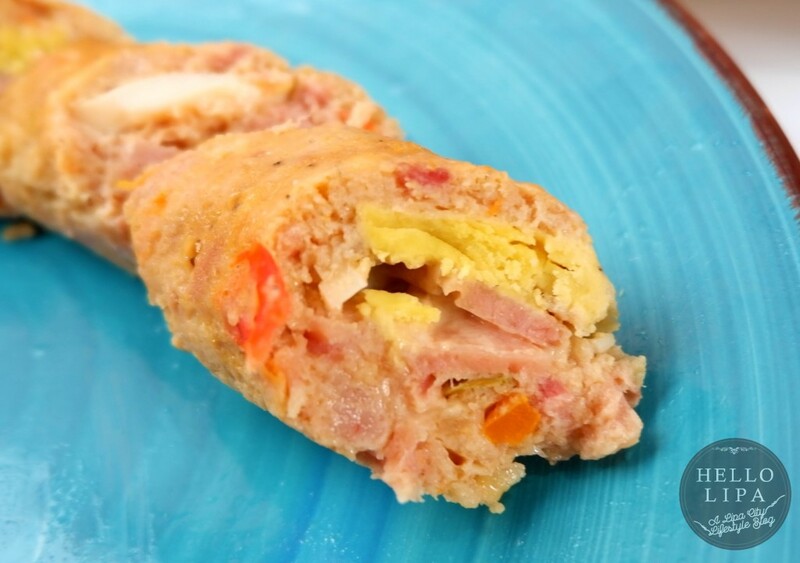 It provides a bit of sweetness and tanginess to the dish. We’ve been hearing good things about their burger. Good thing we got to try their Quarter Deck with Fries. Linmuel explained that their burger patties are cooked well done. Now, this raised my eyebrows as I usually get mine medium. He explained that they do so because Filipinos are generally more receptive to meat that’s fully cooked. 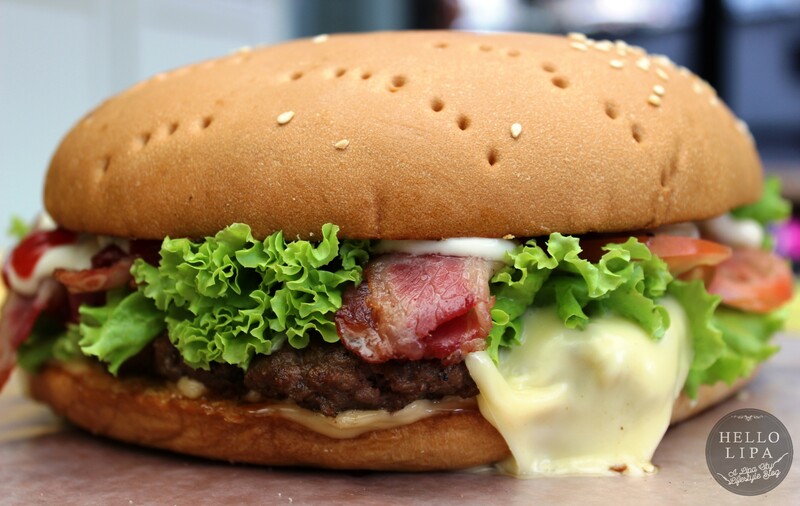 I was afraid that the burger will be tough and too chewy because well done beef tends to be that way. That wasn’t the case. I’m guessing it’s because they use high quality ground beef and they’ve already perfected their cooking process. 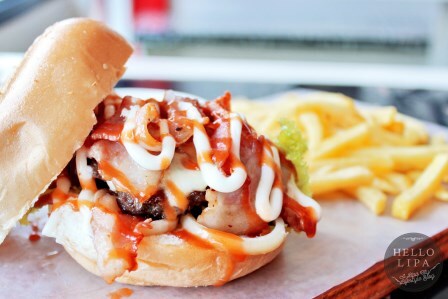 It takes a specific skillset to cook well done burgers that are still juicy so kudos! It helps that it’s topped with juicy and tender bacon! Of course, the fries are the perfect complement for this dish. Craving for pasta? Order the Shrimp Olio! 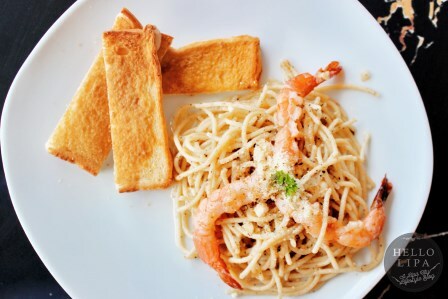 The pasta is cooked al dente, with each strand enveloped with just the right amount of its oil-based sauce. The star of this dish is the shrimp. They’re very plump! Speaking of plump shrimp, check out the shrimp pieces on this Anchor Point Supreme Pizza. 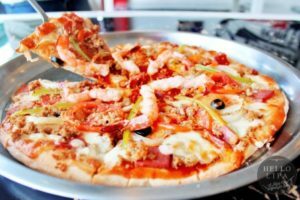 It’s basically a surf and turf pizza as the shrimp is complemented by meat proteins. Is it good? Let’s just say that I had 2 and a half slices! We also tried the American Combo. We’re told that this is one of their best-sellers. You kind of see the reason why when you first look at it. 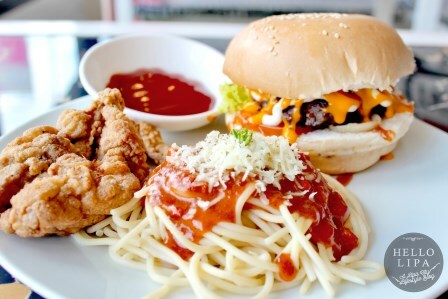 After all, you get the usual favorites of chicken, burger and pasta. As soon as you get a taste of each one, it validates why it’s a best-seller. Get this if you want to try several of their menu favorites in one plate. For a diner, the Oriental Mindoro initially seemed out of place. But hey, this dish fits the template of Anchor Point Diner of serving good food. It’s also a testament to Chef Rogelio’s travels around the world. The afternoon was hot and the meal called for something sweet. Here comes the Rock ‘N Load. Who says no to this refreshing drink? No one. They also have the Strawberry Kiss. You should also try the Sweet Innocence. This cucumber based drink is both healthy and refreshing! 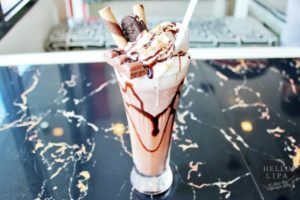 Try Anchor Point Diner Today! 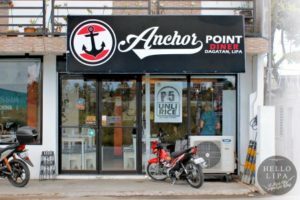 A meal at Anchor Point Diner Dagatan is a voyage of good food and company. Think of it as a trip to a familiar place. 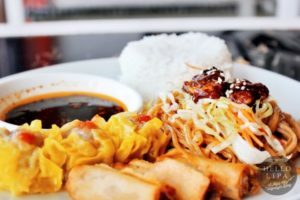 It’s not really a culinary adventure in such a way that you’ll try dishes you haven’t tried before. It’s more like a culinary vacation. 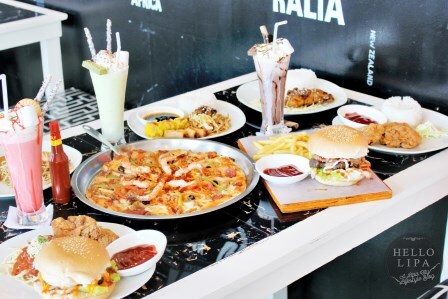 You take a break from your busy life and just sit down and enjoy food and company that you’ve always loved. PreviousFree Dental Clinic in Lipa City by the Philippine Dental Association is a Success! Collosso Lipa: The House of Giant Burgers is Back!